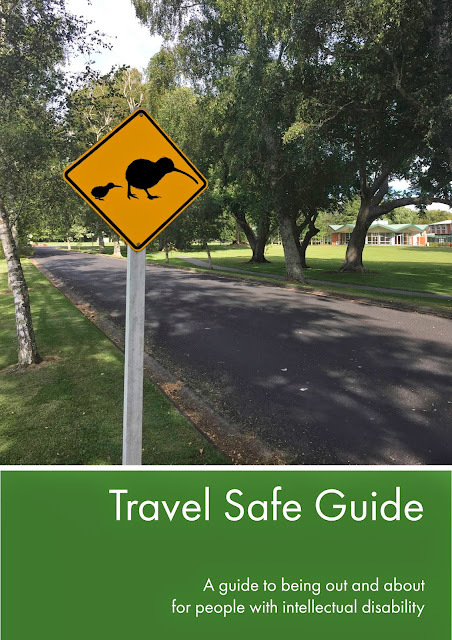 The Guide is in two parts: a video playlist that can be accessed through http://tinyurl.com/Travel-safe-videos (screenshot above) and a hard copy resource that will be available shortly via the IHC Library. The video playlist alone registered 400 views in the first month it was posted - without any advertising - only word of mouth from our Advisory Group (the IHC librarians and a group of users, parents and support staff) who liked what they reviewed so much that they immediately shared it with their own networks. This guide will help you when you are out and about and need to use a bus, train or taxi. It explains some of the things that you need to know to travel safely by yourself. Our deepest appreciation to the IHC Foundation who funded this project. When we made this guide we found out everything we could about travelling safely. We read other guides, we looked things up on the internet, we talked to the police and to road safety officers. We also talked to people with learning disabilities and their families to find out what they felt people needed to know. Then we put all the information together in these videos. We are also publishing a book. To make the book easy to read together with the films we took pictures from the videos we filmed, of the things you will see when you are travelling. We hope that these resources help you to get out and about and travel safely. In consultation with: Tania Garrett, Kyle Hughes, Jan McConnochie, Val Brown, Sarah Edworthy and Sjoukje Ossterveld. Francton Idea group: Wiremu McMay, Hamish Dethaelly, Jess Barlow, Stacey Coy (also acted for our working sessions).